Previously on Miami Vice: We learned a few things about Crockett’s past, and watched him fall in and out love very quickly. 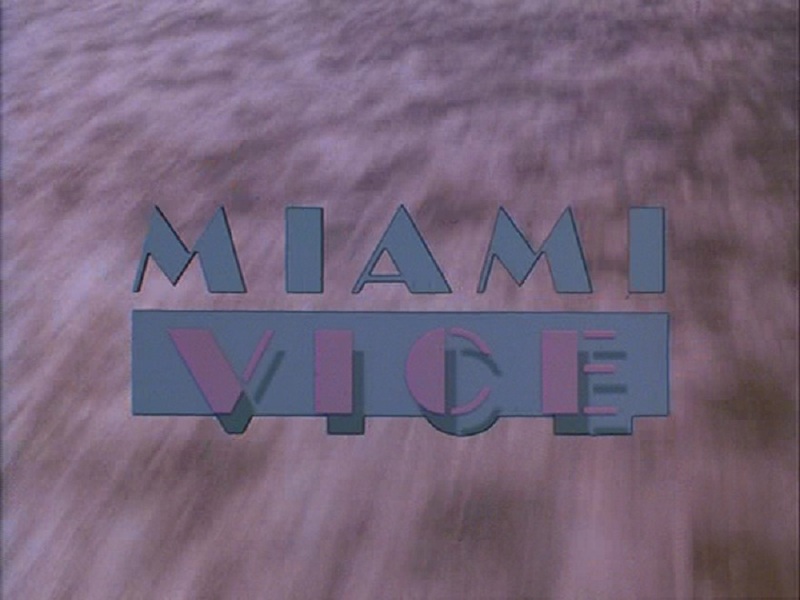 Some weeks ago, I began my discussion of Miami Vice with a focus on the element at the heart of so many discussions about this show: “MTV Cops.” In that opening review, and throughout much of the last string of weeks, I’ve talked a lot about the show’s visual style, its use of music, and the general air of cool that Miami Vice exudes with such ease. But I’ve probably talked just as much, if not more, about the show’s surprising ability to tell solid character-centric stories and develop compelling one-off guest characters that are easy to care about. Vice succeeds aesthetically in all the ways I expected it to. But it thrives narratively in ways that I never imagined as well. Thus, it’s probably fitting that the first season of the show ends with two episodes that are not overly flashy or stylized and instead seemed much more interested in people and their messed up lives. There are no guest appearances from “rock” “stars,” nor are there big, sweeping Phil Collins-backed montages. No, “Evan” and “Lombard” are powered by their dysfunctional namesakes, forcing Crockett and Tubbs (though mostly Crockett because well, of course) to make some tough decisions along the way. “Evan” returns to the story well we have seen a few times in this first season, most notably just last week with “The Home Invaders”: Crockett and Tubbs run into someone from their past. This time, it’s yet another of Crockett’s former cohorts, though Evan Freed was more of a peer than an authority figure. In typical Vice fashion, Crockett and Tubbs find themselves following a complex case involving powerful gun runners and the Bureau of Alcohol, Tobacco, and Firearms. At the center of that case is a loose cannon named Evan who clearly enjoys shooting off MAC-10s in abandoned hangers more than just about one on the planet. And just when it seems like that Evan is going to be one of Vice‘s prototypical villains—smart, a little crazy, white—it’s revealed that not only is he a cop, but he’s a former associate of one Sonny Crockett. Again, we’ve seen this kind of story from Vice before, and frankly, too recently, so I expected not to enjoy “Evan” that much. However, whereas many Vice episodes start with a simple case and (d)evolve into complicated mania, “Evan” pulls the focus towards a quieter, more personal level after beginning with an exciting setpiece featuring guns, car-related mayhem, and explosions. Evan is one of the show’s better guest character creations. He’s not really in control at all, which leads him to both torment and try to reconcile with Crockett in short order. William Russ, aka Mr. Matthews from Boy Meets World, plays Evan as a character right on the edge who has nothing to lose, but also embodies a certain sadness. And while I initially thought that was just an interesting acting choice, the episode eventually reveals its purpose: Evan, Crockett, and another officer Orgel came up through the academy together, but Orgel basically killed himself while on a dangerous call after Evan and Crockett discovered that he was gay. Evan bullied Orgel and Crockett (of course) didn’t do anything about it, resulting in their friend taking his own life. Ever since, both Crockett and Evan struggled with their actions, only one of them handled it much better than the other. I’ve read that this episode is regarded as one of the best in Vice‘s entire run, mostly because of its even-handed (especially for the time) treatment of homosexuality. While I agree with that sentiment and think that Russ and Don Johnson do a nice job of portraying the different kinds of remorse and guilt that could arise after that sort of event, it’s still telling that the character who is actually homosexual is dead and gone and Crockett gets to feel bad simply for not speaking up (not for actually doing anything wrong). In that way, the episode gets the extra pathos from Crockett’s admittedly stirring recollection of events to Tubbs, but doesn’t have to directly engage with the topic. I understand that this aired in 1985 and for the time and place, it’s still worth noting. Nevertheless, I would have been more interested in seeing this story had the show made Past Crockett slightly more villainous—he could still express the same kind of regret—or allowed us to see the events with Orgel happen, even in flashback form. As it stands, this is still a good episode. “Lombard” is similarly low-key and focused on the past, only with a character that we have actually seen before. 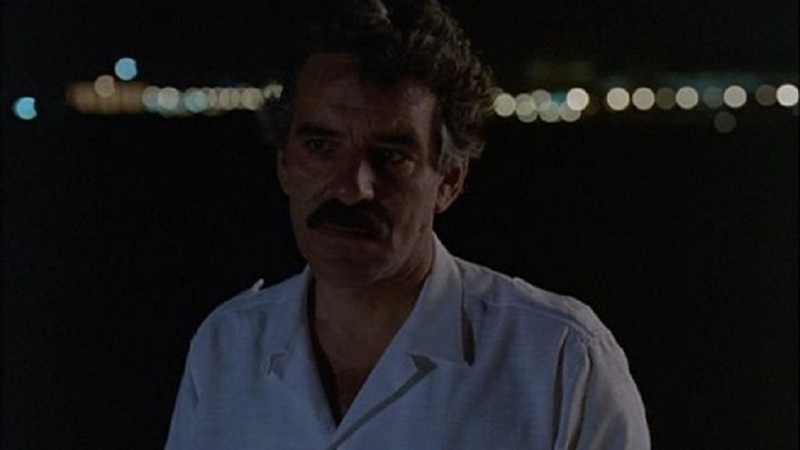 We met Dennis Farina’s crime boss Lombard much earlier in the season in “One Eyed Jack.” There, the character was much more overtly malicious, but Crockett and Tubbs weren’t able to put him away for his various nefarious dealings. Here though, Lombard is portrayed by Farina as more remorseful for things that he’s done, and certainly more interested in connecting with his adult son for the first time in a long time. While I’m predisposed to like characters played by Farina, it does seem like the writers made the conscious choice to humanize the character as a way to show us that hey, even criminals can change and regret their actions over time. And somewhat surprisingly, this transition works pretty well. With the slight shift, Lombard spends much of this episode trying to convince Crockett that he’s not the Worst Man on the Planet, a tension that yields interesting results. There’s a sense that Crockett wants to like Lombard, particularly when they’re stuck with one another playing cards in a cruddy apartment before Lombard testifies, and respects his admittedly crooked sense of honor. However, Crockett just can’t get over the fact that Lombard gave the order to kill Barbara in “One Eyed Jack.” By the time that Lombard changes his mind and ultimately doesn’t give up his bosses in court—again, because of his “code”—Crockett appears to respect the choice, but only up to a certain point. As a season finale, “Lombard” is an interesting choice. There’s a nice multi-level action setpiece near the three-quarters mark, but much of the offering’s running time is dedicated to two or three guys sitting in poorly-lit rooms eating food, playing poker, and shooting the breeze. You might say that this is a subversion of the show’s typical rhythms, but ultimately, it really isn’t. 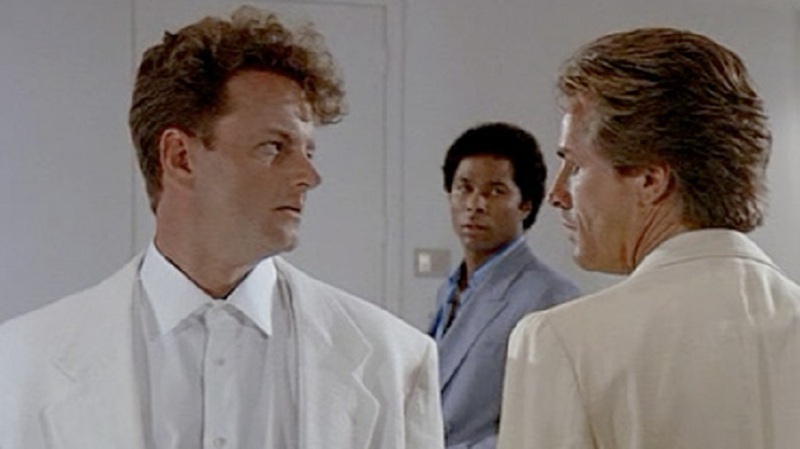 Miami Vice is about the consequences of trying to live the high life outside of the law, but it’s also about how the job runs Crockett and Tubbs into the ground. Asking Crockett to consider respecting a criminal in the season finale is a nice summation of those themes. Watching this first season of Miami Vice has been legitimately illuminating. Like I said up top, I’ve been pleasantly surprised by the show’s ability to develop intriguing characters, even in just one-off offerings. Looking at the show on a episodic basis probably forces us to focus too much on the procedural elements of the storytelling—they’re there, after all—but even those more familiar pieces have worked for the most part. There’s no doubt that the show’s impact is held more on the visual side of things, but it’s not as if Vice completely eschews decent, or even good, stories and characters just so it can blast Phil Collins or Jan Hammer and drive around in pretty cars. While coming into these reviews, I didn’t assume that’s what Vice was, I certainly didn’t expect it to be so strong on a character front. GATOR WATCH: One solid appearance in “Lombard.” I might miss the gator more than anything else as I step away from Vice. GO-FAST BOAT WATCH: Nada. Yachts instead. This is the end of the road for my Miami Vice reviews, at least for now. Right now, I plan on taking next week off to celebrate Thanksgiving very early and then come back the following Monday with something new. I’ll be thinking about where to go, and chances are I might be asking you folks for some input, both here on TWTV and on Twitter. If you have ideas for things you might want me to cover on a more regular basis, let me know. I’ll say that I’m thinking about tackling a comedy next, but other than that, I’m open.